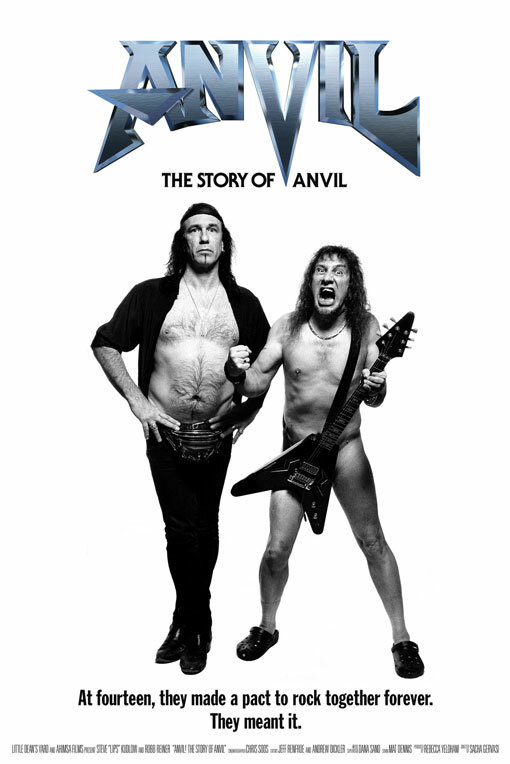 Must See Movie: Anvil, The Story of Anvil! Yesterday, Geoffrey and I celebrated the first day of really nice NYC weather in over six months by sitting in a dark theater, enjoying the fantastic new documentary, Anvil: The Story of Anvil. You may have heard this film being referred to as a “Real Life Spinal Tap,” but I assure you that the story of this Canadian Metal band that grasped for fame only to fall into obscurity is all too true. A few of the metal drummers I’ve interviewed in my career have cited Anvil drummer Robb Reiner as an influence, so I had heard of them, but only by name. Anvil: The Story of Anvil tells an unintentionally hilarious and truly emotionally moving music industry tale that I am sure a gazillion other bands can relate to, yet Anvil imbue this film with so much heart, I can’t imagine any other “almost was” metal band creating an experience quite like the one you get in this film. Back in the ‘80s Anvil were poised to be the next big thing; touring Europe with supporting gigs for Iron Maiden and The Scorpions, and inspiring peer-group fans that included members of now legendary bands like Metallica, Anthrax and Guns ‘N’ Roses. But where those bands continued on to achieve great commercial success and global fame, it didn’t quite work out that way for Anvil. What went wrong? There is no doubt that the music is strong and these guys are great musicians, and certainly they did not lack anything in the passion-for-what-you-do department. Anvil is both an incredible inspiration and a highly entertaining cautionary tale that I absolutely loved every minute of. Definitely add it to your list of films to see in the theaters before it comes out on DVD in a few months. I give it two thumbs up. The subject matter of the first song they ever wrote is worth the price of admission alone!